Born into an artistic family in New York in 1913, Ted began painting in oil at the age of 7. His Hungarian immigrant parents insisted that their 3 children, Ted, Charles and Ruth pursue their own artistic talents. Lagos, his father, was a published writer who worked in the garment district of Manhattan, while Llona, his mother was a singer. When he was 7, Ted began his art education at the Leonardo da Vinci School of Art in Manhattan. He began working with clay at age 10 and later won a 3 year scholarship to the Master Institute of the Roerich Museum in New York. He was then introduced to the Oriental Arts from China and Japan in which he learned the fundamentals of dynamic symmetry. His brother Charles became a successful commercial artist while Ruth, his sister, became a painter. In 1947, they had a joint exhibition, “The Three Egris,” in New York’s Roko Gallery. During his involvement in the WPA, Ted was an early member of the Artists Union. This group evolved into the Artists Congress and then the Artists Equity when the WPA ended. Ted was the national vice-president of the Artists Equity that developed conferences in New York for artists and museum directors throughout the country to establish ethical behavior. The American Federation of Arts then adopted these resolutions as standards for all art related organizations. Following his work with the WPA, Ted returned to commercial art, employed by Time and Fortune magazines. During this period, he assisted Irving Geis who was creating statistical survey charts. Soon thereafter, Ted moved to Washington DC to work for the Hydrographic Department before enlisting in the Navy. He then became a map draftsman for invasion purposes and was sent to New Guinea on an amphibious command ship. During his wartime activity aboard ship, Ted was in charge of map reproduction for the Air Force and Navy, prior to invasion. Upon request, he was granted the right to paint in his free time. Concerned about the possibility of their ship being sunk, Ted sent his paintings back to an Admiral in Maryland for safekeeping. Some of these paintings have been preserved and clearly document his experiences. Following the war, he returned to New York and resumed his life as a commercial artist. In 1948 to 1949, he taught at the Art Institute in Kansas City. Overloaded by the number of students and required hours to teach, he began sculpting as a release from the tension of not being able to paint. Under the influence of his father, a strong humanitarian who organized one of the first factory unions in his industry, Ted created his first sculpture pertaining to social injustice. In 1949, “Hands Reaching Through Bars” was “inspired by a wrongful murder conviction involving six African Americans in Trenton, NJ.” Many of his works have involved themes of the oppression of Blacks, Hispanics and Jews. In 1950, Ted married his wife Kit and moved to Taos. He worked under the GI bill, first with Louis Ribak’s School of Arts and then with Emil Bisttram’s School. Once the GI bill funds ended, he began to weld his own sculpture as well as other odd projects involving welding. Ted and Kit lived in a 2-room adobe home without plumbing for twenty dollars a month. As one of the original founders of the Taos Art Association in 1952, Ted was an active member of the Taos community and Taos County. Kit, his wife became the Stables Art Gallery director where the couple conducted classes and arranged lecture series. That same year, the vibrancy of the Taos Art Colony was re-established through an important show at the Colorado Springs Fine Arts Center. This exhibition titled “Taos Painting Yesterday and Today,” featured 9 of the original founding artists and 21 contemporary / modern artists including Ted Egri. Ted had the privilege of knowing some of the Taos Founders who were his neighbors on Ledoux Street such as Blumenschein, Berninghaus and Phillips. During the next few years, Ted’s artistic and financial future was uncertain as he re-entered the academic world. For approximately a year and a half, he taught at the University of Wyoming in Laramie in 1958. He then proceeded to teach sculpture for a brief period as a visiting artist at the University of Illinois followed by the State College of Iowa. Following each teaching assignment, he was eager to return to Taos. During the 1970’s, Egri helped pilot art programs, sponsored by the National Endowment for the Arts for grades 3 through 12, reaching 2,000 students in 12 schools in Taos, Ranchos, Arroyo Seco, Questa and Penasco. After working with this program, Ted stated, “I have become a strong advocate of early art training for character development and growth, and believe in training the young to become aware of their environment and their art heritage.” Another widely known project in Taos was Ted’s restoration of El Vibaron, the rattler/dragon that was the delight of every child during Las Fiestas de Taos Children’s Parade. Profoundly influenced by the Taos landscape and cultural diversity, Ted began to focus on his own sculpture. 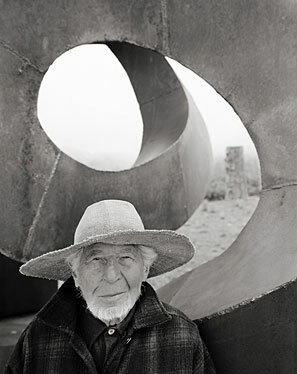 At this time, he developed the concept of abstract form in space as he experimented with a variety of durable, outdoor substances such as ground glass mixed with polyester resin as well as cor-ten steel. During this artistically expansive period in the 1970s to 1980s, Ted developed large scale sculpture commissions for corporate and private clients in Colorado, Texas and New Mexico. He began working in bronze and traveled to Pietrasanta, Tuscany to cast several works at the Tommasi Founderia. Throughout the country, he was featured in numerous one-person exhibitions that were sponsored by galleries, museums and private residences. Influenced by his experiences in WWII, Ted experimented with creating dynamited sculpture. In 1989, New Directions Gallery in Taos, presented his first exhibition featuring a combination of historical paintings from his days aboard the Navy ship along with his new sculpture. These sculpted forms were created by blasting sheet metal, then working the forms to create a sculpture and possibly blasting and reworking them again. Important public acts of recognition began to occur for Ted. In 1996, he received the Governor’s Award of Excellence in the Arts for working with unrecognized artists of all cultures, ages and socioeconomic groups. Ten years later, the Mayor of Taos, Bobby Duran proclaimed May 21, 2006 as Ted Egri Day, acknowledging his sensitivity to the needs of minorities, providing opportunities for them to share in his creative techniques within his personal studio. This same year, Ted remarried Janet Macy, following the death of Kit in 1998. Together, they began to catalogue his extensive inventory of paintings and sculpture. They also worked on creating the Taos Art Organization, a nonprofit learning center for the community. A number of artists who were developing their careers, lived and worked on Ted’s property, assisting him with welding and other aspects of making sculpture.